Life as Pink Einstein | Dallas Fashion and Lifestyle Blogger: Fourth of July Outfit Ideas! 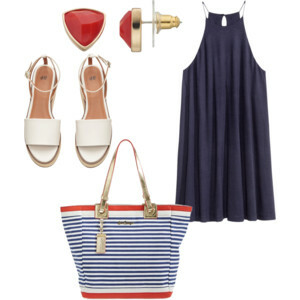 Fourth of July Outfit Ideas! 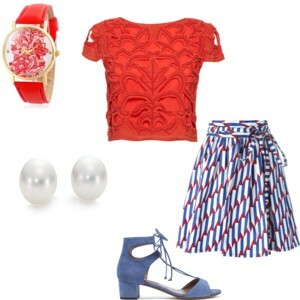 Polyvore has been my most recent obsession so I created a few Fourth of July outfits to help you figure out what to wear. Comment below telling me which outfit is your favorite, mine would have to be July Fourth BBQ. This first outfit is for a more dressy celebration for if you won't be getting dirty or spending your day outside. The shoes that I paired with this outfit are so unique and fun I really adore them! The crocheted top looks so good with the patterned midi skirt and the watch is just a nice added touch. To view the details on this outfit click here. I really love this outfit! This romper is so simple and you can dress it up with a statement necklace like I did above or just wear it with some cute braids and red nail polish. This outfit would also be great if you planned on swimming; you can easily slide the Birkenstocks off and your bathing suit can be worn under the romper. If you plan on doing fireworks or something fun like that, just add the pearl earrings and the cute necklace for the perfect outfit! You can click here to view the details of this outfit. This is more of a preppier look with the Kendra Scott necklace and silver classic Jack Roger sandals. The shorts are high waisted with great buttons. The striped shirt is where you get your July 4th colors incorporated into your outfit and this shirt would look great tucked into the high waisted shorts. The details for this outfit can be found by clicking here. Happy Fourth of July! If you have a cute Fourth outfit send me pictures!